The Poppy Seed Festival returns to Melbourne for its second year, opening with Fleur Kilpatrick's Blessed, a modern retelling of the angel Gabriel's visit to Mary informing her that she is to be the mother of Jesus. While her previous work, The City They Burned, successfully re-imagined the story of Lot and the fall of Sodom into contemporary times, in this production there is too much effort in pushing the religious undertones, whereupon I felt the authenticity of what Kilpatrick is attempting to create gets blurred. The story follows Maggie and Grey (Olivia Monticciolo and Matt Hickey) who after years of no contact are reunited in Grey's grimy and shabby home. These are people who are from the lower end of the socio-economic spectrum, living in community housing who are struggling to make ends meet with low paying jobs. While the idea of these two people being involved with The Annunciation is an interesting exploration of the above issues facing many today, the story never quite gets to making as much as an impact or statement as it should; and for me, if this is a love story, then Hickey and Monticciolo are also unsuccessful in finding it in their characters. 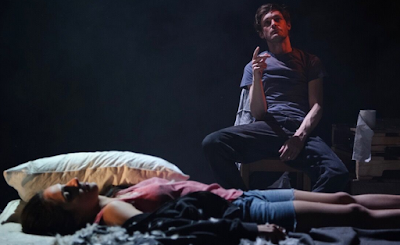 While effort has clearly gone into developing Grey and Maggie, the relationship between them doesn’t seem to resonate convincingly on stage and the journey to get to the finale seemed to stagnate at times. Even some adroit direction by Danny Delahunty failed to ignite a spark in the performances or keep the momentum building. Kilpatrick may have a deeper message to impart with Blessed in terms of class, love and equality but unfortunately this production feels as messy as Grey's bedroom. *Original review appeared on Theatre Press on 17 November.